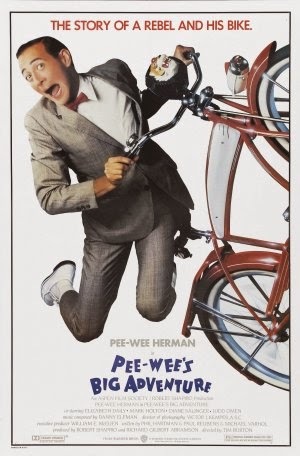 Tag line: "You will believe a man can ride a bike"
Pee Wee Herman (Paul Reubens) is one wacky dude. Living by himself in what amounts to a carnival funhouse (he has an elaborate system, involving pulleys, strings, and an anvil, that automatically makes his breakfast every morning), Pee Wee has one passion in life: his bicycle. Loaded with tons of accessories (including a headlight, a compass, and a horn you can hear from miles away), it’s the only thing he owns that he keeps under lock and key. Alas, not even the sturdiest chain can protect it forever, and one day, while he’s in town picking up a new horn, Pee Wee’s bike is stolen. At first, he’s convinced the thief is Francis Buxton (Mark Holton), a wealthy neighbor who’s coveted his bike for years, but when Francis’ alibi checks out, a distraught Pee Wee consults a fortune teller (Erica Yohn), who, for a small fee, reveals that his bike has been taken to Texas, and is currently sitting in the basement of the Alamo! Thus begins a grand adventure, with Pee Wee hitting the open road in a desperate attempt to reclaim his stolen property. Will he make it to the Alamo in time, or is his beloved bike lost forever? Like its lead character, Pee Wee’s Big Adventure is an unusual movie, but part of its charm is that it takes Pee Wee and his adventure very seriously. Of course, I didn’t realize this early on; the opening moments, where we watch Pee Wee’s morning routine (getting dressed, eating breakfast, etc), are downright bizarre (jumping out of bed with a smile on his face, Pee Wee starts the day off by putting on his bunny slippers and playing with his toys). Was I supposed to laugh at this overgrown child? Well, sure… but to build an entire film around a guy who’s nothing more than a self-parody would’ve gotten old real quick. It’s obvious that Reubens has some affection for this character (my only prior experience with Pee Wee Herman was an adult-oriented stage show that played on HBO in the early ‘80s, a precursor of sorts to Reubens’ Saturday morning kids program a decade later), and by presenting him on his own terms, we, too, come to admire Pee Wee Herman, and hope that, in the end, he gets both his bike and the girl (Dottie, played by Elizabeth Daily, works at the neighborhood bike store and has a crush on Pee Wee, though it takes our hero a while to realize this). Almost as much fun as Pee Wee himself is his adventure, during which he hitches a ride with an escaped felon (Judd Omen), is picked up by a ghost driving a big rig (Large Marge, wonderfully portrayed by Alice Nunn), and meets a waitress named Simone (Diane Salinger) who, trapped in a terrible relationship, dreams of flying off to France to start a new life. Before it’s over, Pee Wee will even find himself on the backlot of Warner Bros. Studios, an extended sequence (much like the finale of Mel Brooks’ Blazing Saddles) that also has its share of excitement. Yet, despite the strange people he encounters and the various dangers he faces (soon after beginning his journey, he inadvertently pisses of a gang of angry bikers, who threaten to kill him), Pee Wee continues to approach things with a child-like innocence, which has an effect on everyone he meets (the advice he offers to Simone is simple, yet poignant), making Pee Wee’s Big Adventure one of the most interesting “road movies” I’ve ever seen. Marking the directorial debut of Tim Burton, Pee Wee’s Big Adventure packs a whole lot of imagination, and even some pathos, into its story of a man-child and his bike, and it won’t take more than one viewing to understand why it’s become a cult classic. I really need to rewatch this. I saw it in theaters when it came out and hated it. I was a teenager then. Think I was simultaneously too old and too young for this movie. Small kids and adults all loved it. My friends and I didn't. In the years since I've heard repeatedly how brilliant this is and become a Burton fan. Thanks for the reminder.